If you sift through some of the foul-smelling data, it turns out 365k of the alleged jobs were part-time, which means the labor market lost 52k full-time jobs. But alas, I loathe paying any credence to complete fiction by dissecting the “let’s pretend” report. The numbers make no sense. Why? Because the alleged data does not fit the reality of the real economy. Retail sales, auto sales, home sales and restaurant sales have been declining for the past couple of months. So who would be doing the hiring? Someone pointed out that Coinbase has hired 500 people. But the retail industry has been laying off thousands this year. Given the latest industrial production and auto sales numbers, I highly doubt factories are doing anything with their workforce except reducing it. And if the job market is “so strong,” how comes wages are flat? In fact, adjusted for real inflation, real wages are declining. If the job market was robust, wages would be soaring. Speaking of which, IF the labor market was what the Government wants us to believe it is, the FOMC would tripping all over itself to hike the Fed Funds rate. And the rate-hikes would be in chunks of 50-75 basis points – not the occasional 0.25% rise. Last week I summarized January existing home sales, which were released on Wednesday, Feb 21st. Existing home sales dropped 3.2% from December and nearly 5% from January 2017. Those statistics are based on the SAAR (Seasonally Adjusted Annualized Rate) calculus. Larry Yun, the National Association of Realtors chief salesman, continues to propagate the “low inventory” propaganda. But in truth, the economics of buying a home has changed dramatically for the first-time and move-up buyer demographic plus flipper/investors. As I detailed a couple of issues back, based on the fact that most first-time buyers “buy” into the highest possible monthly payment for which they can qualify, the price that a first-time, or even a move-up buyer, can afford to pay has dropped roughly 10% with the rise in mortgage rates that has occurred since September 2017. The game has changed. That 10% decline results from a less than 1% rise in mortgage rates. That same calculus applies to flipper/investors. Investors looking to buy a rental home pay a higher rate of interest than owner-occupied buyers. Most investors would need the amount of rent they can charge to increase by the amount their mortgage payment increases from higher rates. Or they need to use a much higher down payment to make the investment purchase. The new math thereby removes a significant amount of “demand” from investors. It also occurred to me that flippers still holding homes purchased just 3-4 months ago are likely underwater on their “largesse.” Most flippers look for homes in the price-range that caters to first-timers (under $500k). This is the most “liquid” segment of the housing market in terms of the supply of buyers. Any flipper that closed on a home purchase in the late summer or early fall that needed to be “spruced up” is likely still holding that home. In addition to the purchase cost, the flipper has also incurred renovation and financing costs. Perhaps in a few markets prices have held up. But in most markets, the price first-time buyers can pay without significantly increasing the amount of the down payment has dropped roughly 10%. Using this math, any flipper holding a home closed prior to October is likely sitting on a losing trade. Similar to 2007/2008, many of these homes will be sold at a loss or the flipper will “jingle mail” the keys to the bank, in which case the bank will likely dump the home. I know in some areas of metro-Denver, pre-foreclosure listings are rising. Some flippers might turn into rental landlords. This will increase the supply of rental homes which, in turn, will put pressure on rental rates. New home sales – The plunge in January new home sales was worse than existing homes. New home sales dropped 7.8% from December. This follows December’s 9.3% plunge from November. The December/January sequence was the biggest two-month drop in new home sales since August 2013. Back then, mortgage rates had spiked up from 3.35% in June to 4.5% by the end of August. The Fed at that time was still buying $40 billion worth of mortgages every month. 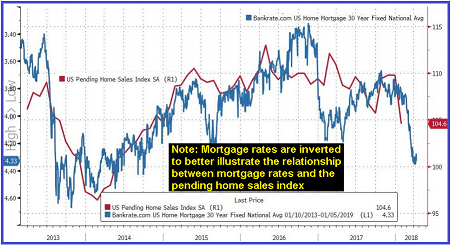 With QE over and an alleged balance sheet reduction program in place, plus the Fed posturing as if it will continue nudging the Fed Funds rate higher, it’s likely that new home sales will not rebound like they did after August 2013, when mortgage rates headed back down starting in early September 2013. Contrary to the Larry Yun false narrative, the supply of new homes jumped to 6.1 months from 5.5 months in December. How does this fit the Yun propaganda that falling sales is a function of low inventory? The average price of a new home is $382k (the median is $323k). New home prices will have to fall significantly in order for sales to stop trending lower. What happens if the Fed really does continue hiking rates and mortgage rates hit 5%? January “Pending” Home Sales – The NAR’s “pending home sales index,” which is based on contract signings, was released this past Wednesday. It plunged to its lowest level since October 2014. The index dropped 4.7% vs. an expected 0.5% rise from the optimist zombies on Wall St. It’s the biggest 1-month percentage decline in the index since May 2010. On a year-over-year comparison basis, the index is down 1.7%. December’s pending home sales index was revised down from the original headline report. Housing sales data is lagged by a month. Per the blue line, current homes sales (i.e. February sales/contract signings) have likely declined again given that mortgage rates continued to rise in during the month of February. The above commentary on the housing market is from the latest Short Seller’s Journal. Myself and several subscribers have been making a lot money shorting homebuilders this year. But it’s not just about homebuilders. I presented ZAGG as a short in the SSJ in the December 10th issue at $19. It plunged down to $12 yesterday. I’ve had several subscribers report gains of up to 40% shorting the stock and 3x that amount using puts.